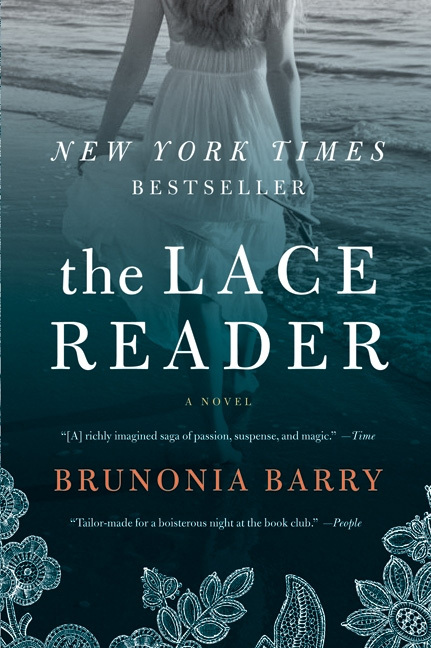 Brunonia Barry’s The Lace Reader is exactly the type of debut novel I love. It isn’t without flaws, but there is enough evidence of brilliant writing to make me feel like I’ve gotten in early on discovering a new writer who raises the craft. I guess I should qualify “gotten in early” – this novel was published in 2008, but I just found it. When in first person, The Lace Reader is by a narrator (Towner Whitney) who early on admits she’s unreliable. 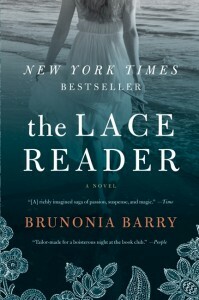 However, she weaves such a personal and convincing tale, about her broad heritage of eccentric women who are “seers” or “lace readers” – telling futures by looking into a unique form of lace – Ipstich, that the reader soon forgets to question the story as she tells it. Towner has come home to Salam, Massachusetts, after her great-aunt’s mysterious death, and with the help of a local cop who had befriended her aunt, begins to resolve pieces of her past she had left unraveling. An example of Barry’s literary flaws is not explaining the name of the local religious radicals – the Calvinists. They are named such after a pivotal character, Towner’s uncle Cal, and are not to be confused with the Presbyterian sect of the same name. Barry lets this go on for more than half the novel before she clarifies for the reader that she understands the difference. I don’t think writers should let readers think they are smarter than the creator, and this errors allow that. Nevertheless, Barry impresses with smart prose and beautiful language. Her plot is correctly compared to the narrative M. Night Shyamalan has put on screen. She capitalizes on a perfect setting – one where “witchcraft isn’t a crime, it’s a profit center.” For characters there are bad mothers and abusive husbands, ghosts and a lost twin – and perhaps the ghost of a lost twin. There are journals about lace and journals from asylums. All in all, it is a wonderful story, and good enough that I’ve already bought her second that was published last year, The Map of True Places. I can’t wait until I have time to devour it. If it lives up to The Lace Reader, Barry will have a loyal fan in me.